I’ve just completed 2 new SharePoint videos that are available on YouTube. <img src="http://lh5.ggpht.com/-9etHa6mBcgo/UOUbaZm6GmI/AAAAAAAAGqM/71FETOpwL8s/video5f136636f048.jpg?imgmax=800" style="border-style: none" galleryimg="no" onload="var downlevelDiv = document.getElementById('325025fc-73cb-4877-81ce-f1a079c6965a'); downlevelDiv.innerHTML = "
The first video is a 10 minute preview of the 30+ minute Getting Started with SharePoint Online for Enterprises. It provides the basics you need to start using SharePoint Online via Office 365 E 3 plan. This video’s companion is Getting Started with SharePoint Online for Small Business which is also available on YouTube. <img src="http://lh6.ggpht.com/-KgmBokqxHuM/UOUbbW8DTMI/AAAAAAAAGqQ/XheYh6hnLeQ/videoa9a52a064978.jpg?imgmax=800" style="border-style: none" galleryimg="no" onload="var downlevelDiv = document.getElementById('5d6f6bb4-9f6c-4f7c-a45f-eeccf28d5aa6'); downlevelDiv.innerHTML = "
The second video called “SharePoint to the Cloud” is a replication of a presentation I recent gave. It provides a basic overview of SharePoint and especially the options that are available in the cloud, particularly when it comes to Office 365. That video is about 38 minutes and hopefully will answer a few questions people may have about SharePoint in general. and I welcome any feedback you might on these or any topics you’d like to see covered in a video. Feel free to email me directly (director@ciaops.com). 1. There will apparently be no Search Server Express 2013. The model around search in SharePoint is changing. It seems SharePoint Server 2013 Standard will search only across SharePoint sites. To enable the ability to search external data, like file shares, will require SharePoint Server Enterprise. Given that SharePoint Foundation can also search across SharePoint sites I don’t quite understand how all this fits together. Does that mean that SharePoint Server Standard search is the same as SharePoint Foundation search? What it seems to mean is that there will be no stand alone free search product. 2. 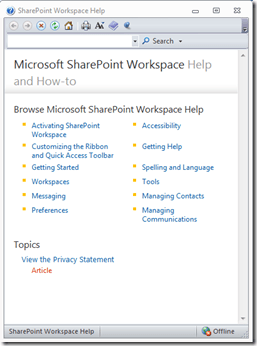 To use Office Web Apps with SharePoint will require a separate server. Apparently, you can’t install SharePoint and Office Web Apps on the same piece of hardware. This is because Office Web Apps functionality can also be consumed by Exchange Server 2013. Therefore it needs a separate box. 3. SharePoint Workspace is end of life. The replacement for local sync’ing of documents will be SkyDrive Pro, which will run a small app on the local machine and create a local folder in which it will store off line material. Interestingly, this mean one less product in Office Professional Plus as well. That kinda makes it a little less valuable doesn’t it to my way of thinking? However, I would say that I couldn’t see a future for SharePoint Workspace. It was kinda a product looking for a home, somewhat like Ray Ozzie. 4. Microsoft will be releasing native apps for a range of mobile devices including iPads, iPhones, Windows Phone and Android. This was a very exciting piece of news and not unexpected given what Microsoft have done with OneNote and Lync of late. It will be very interesting to see how these apps compare to the existing third party ones. I certainly look forward to their integration with Office 365 being better. 5. The difference between SharePoint on premise and in Office 365 is slight. Not unexpected but for a smaller business that wants to take advantage of all the SharePoint goodness, including the new Office Web Apps, it now makes so much more sense to go with Office 365. The infrastructure stuff if becoming more difficult and more expensive as it ‘defaults’ to enterprise installations (with lots of hardware). If you want to get all the benefits of the latest in SharePoint without the deployment and infrastructure headaches, Office 365 is the go. 6. If you are planning to upgrade from SharePoint 2007 (MOSS or WSS v3) to SharePoint 2013 onsite you are still going to have to do it in two hops. Firstly, to 2010 then to 2013. This is the same as it was from WSS v2 to SharePoint Foundation 2010. Sigh. I understand why but it would be nice to not have to run up a “swing” migration server just to upgrade. A number of interesting changes happening with the SharePoint product. The most interesting for me will be the native apps for mobile devices as well as Skydrive Pro functionality. When I know more I’ll post here. Mark O’Shea returns to the podcast to give us an update on what been happening with him and technology. Mark shares insight from Microsoft TechEd US as well as what he see coming down the pipeline from Microsoft. Beware, plenty of opinions are expressed in this episode. As I pass the local cafe strip this morning I noticed a recently opened cafe had a for lease sign in the window. It would be unsurprising to me if they have unfortunately gone out of business because to my mind they had missed some very important opportunities to stay in contact with their customers. To start with, the cafe never had an email address. How many people live via their email these days? I did have cause to contact the cafe about an event I was organizing there and guess what? An email is so much easier than looking up their phone details and they are free! Strike 1. Next, they never had a web site. Not even a basic one. It isn’t difficult to create a very basic free one page web site with a registered domain. I have created lots of my own special interest web sites using the free Google Sites tool (www.ciaops.org.au if where you’ll find them). They are far from perfect or Web 2.0’ized but guess what? They are up there and they work. They get the message out. Having a web site would have been really handy when the cafe decided to change their opening hours unbeknownst to me until I arrived on the doorstep early one morning for a meeting. I can tell you that I was not please at all that the only way I could find out about this was by coming to the establishment. Strike 2. I am only assuming here, but surely it isn’t too difficult to get your establishment listed in local Internet guides, coffee sites, etc? This is where I would think that you start attracting a regular audience and community. You make it easy for them to provide feedback, you solicit comments and you reward regular customers. Hell, even a Facebook page is easy to set up these days. I can’t understand why they didn’t make it easy for people to ‘check in’ on Facebook or Four Square. Why? Because the people that do this sort of thing are the influences. They are the people that other look and see what they are doing and then follow. These influencers are connected. They expect the places they frequent to be connected and easy to ‘check in’ to. So, strike 3 and you’re out. I watched with interest as this local cafe started up. I frequented the establishment in an effort to support a local business but I could see that it was going to struggle without embracing even the simplest of technologies. Just like water and electricity any business needs to embrace technology and explore what can help them retain customers and better engage with them. Surprisingly, much of the technology is free and simply requires a little bit of effort to setup and maintain. It is all about using the best tools for your business and technology is something EVERY business owner needs to have on their tool belt. The of the simplest and most effective business tools is the humble checklist. The other great thing about checklists is that you can use them just about everywhere. The power of checklists for me really hit home when I used to run up servers for a living. Before I decided to adopt the checklist mentality, I’d always be forgetting something or getting lost on exactly what step in the process I was on. Enter a simple check list. My server checklist started off pretty basic but over time it grew to be quiet comprehensive. Sure it doesn’t give you a perfect result every time but it makes the chances much better and it provides you with a much more consistent result. The other thing with a good checklist is that you can give it to someone else to follow and they should get the same result. So many businesses I see make the same mistakes over and over again. They are totally inconsistent with what they are delivering. This doesn’t just apply to small businesses it also applies to big business as well. If you are planning on repeat any process, then that is an opportunity to develop a checklist for it. Sure, it takes a little time up front but the more time you do it the easier it becomes with a checklist. Chances are that once you have a good checklist you can start automating some of the steps in there to save you time. There are a multitude of technologies that can not only create checklists but also automate them. I am going to point out SharePoint as something that I use regularly for checklists. I also use OneNote extensively for checklists since I can access it on every device that I have, just about anywhere that I am. Another really great free app I use is called Wunderlist which has a really simple interface and allow me to track my to-do list. If you are repeating processes and not using a checklist then you are doing things the hard way Spend a little time, create a checklist and then use it the next. I guarantee you’ll see the improvement and save time. I really feel the added features and integration that Windows Phone provides when working in a Microsoft environment make all the difference and allow business to actually use mobile devices for what they are supposed to be for, getting the job easier and quick. Well done Darryl and roll on Windows Phone. The cost is $249 inc GST which includes all meals, parking, Wi Fi access, course notes and more. If you use the promotional code EARLYBIRD prior to the 1st of September you’ll receive a $50 discount off the entry price! Although it is not a recommended option you could use SharePoint as a file storage repository and have those files sync’ed to a local desktop using SharePoint Workspace. There are of course limitation around this, however as I have found out recently, determining these limits conclusively has proved to be very, very difficult. What follows, I believe, is the most reliable information that I have found about those limits. So the very first limit you need to be aware of is that the total number of files you can sync in SharePoint Workspace 2010 across all workspaces is 10,000.
which doesn’t really tell you much about the file limits now does it? You will probably find out there on the Internet different information about the maximum local storage of SharePoint Workspace being 2GB. However, does that mean 2GB in total or 2GB per synchronize workspace? Thus, if I have a SharePoint document library that has 3GB of files, can I synchronize all that in one workspace? (i.e. is the 2GB a hard limit or a ‘recommended’ limit) Or do I have to split that library into 2 x 1.5GB SharePoint sites and sync these as different workspaces? Or, because the total file limit exceeds 2GB will I be able to sync at all? This seems to mean that the total I can synchronize in any SharePoint Workspace is 2GB. Thus, from my scenario above, I would need to split my 3GB of files into 2 x 1.5GB SharePoint sites and sync these independently with SharePoint Workspace. However, my understanding that SharePoint Workspace has a total limit of 10,000 files across all shared folders as mentioned above (which is below the 20,000 limit I calculated above). Although from what I have read this is not a ‘hard’ limit, just a limit beyond which you may start seeing recurring errors. This to me seems to be as conclusive as I can find and I of course acknowledge that SharePoint Workspace was never designed for this capacity. It is aimed at taking small components of SharePoint offline rather than being a total offline sync tool or backup facility. However, I am certainly getting more and more questions about doing exactly this with SharePoint Online. So the idea that SharePoint Workspace is limited to 2GB because of a ‘shared folder’ limitation is incorrect it turns out. 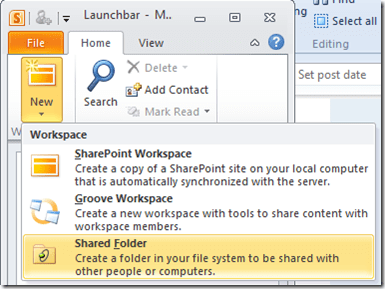 A ‘shared folder’ in SharePoint Workspace actually doesn’t refer to a SharePoint site all! A ‘shared folder’ is actually one you set up with SharePoint Workspace on your desktop and share that directly with other users! So back to the original question. If I have a SharePoint site with > 5GB of data including document libraries of > 2GB are there any issues with sync’ing? It now seems that if you sync SharePoint Workspace directly to a SharePoint site there is NO LIMIT on how large that site can be and for it to successfully sync locally. How mind blowing is that? I always though SharePoint Workspace had a hard upper limit, but no it appears not! With that in mind what a fantastic cloud based sync’ing tool it makes! Even though I have read that you SHOULDN’T use SharePoint Workspace as a backup tool for SharePoint it certainly appears that you can based on the above testing. Now, I get the impression that even though the tests indicate there are no limits I’ll bet that if you do go to these extremes and get issues Microsoft will say that SharePoint Workspace isn’t recommended to be used in that manner. From my tests, it certainly appears it can be, however buyer beware I guess as I can’t find it documented anywhere as to what the actual limits are. – SharePoint Workspace is not free, it is an add on product that comes with Office 2010 Professional Plus but can be purchased independently. – Has a number of limitations around the maximum number of files and data that can be sync’ed locally. This appears to be 10,000 files in total across all SharePoint Workspaces, 5,000 files and 2GB of data per Workspace. – Individual files > 1GB can’t be synchronize but SharePoint Online already has a current restriction of 250MB per files so in Office 365 250MB will be the limit per individual file. – There are other third party solution that can be used to achieve this functionality. So you can if you really must be beware of the current limitations around SharePoint Workspace. SharePoint was designed as a tool to be used ONLINE rather than merely being something that you sync locally and use OFFLINE. However, I get the feeling that going forward we will see more of this offline ability but for now beware the limitations.